We’ve all been the new kid at one point or another and, for most of us, it never gets any easier. Add that to the emotion of the transition from your home to a senior living community and there’s bound to be some nerves, some uncertainty. We get it! But here’s what we want you to know. First, it’s OK! 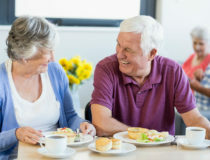 Second, the following tips can not only help your first day in a senior living community to be less stressful, but also set the tone for much more joy to come. It’s best to be prepared, as much as possible, with careful planning before move in day. By that we mean make sure you’ve completed all the new resident paperwork and have oriented yourself to the community and its policies. 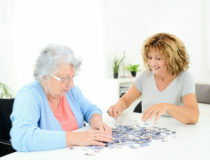 To ease the transition even further you could also visit the community often to have a meal, participate in activities and get to know the staff as well as your new neighbors. These steps can make that first day less intimidating, allowing you to relax and focus on settling in. For you to consider your new senior living community home, it has to feel like it. So one of the first things you should do on moving day is to set up your space. Arrange your photos, keepsakes, any furniture and personal items to make it feel comfortable and familiar. Then sit back and relish the fact that with all the maintenance, housekeeping and laundry done for you, now all you have to do is enjoy your space. Check out Sonata’s floor plans to help you envision your space. Chances are you already know the management team from when you first toured the community. And, you may already know most of the staff if you’ve followed our suggestion to visit often before move in. But if there’s anyone you haven’t met, in particular those who will provide your daily care, seek them out (unless they find you first! ), share your preferences and get to know more about them. It will set your mind at ease about the loving care you’ll receive, and who knows, they may just be some of your biggest champions. For many, the hardest part of being the new kid is to find a way to fit in. Luckily, senior living communities typically have new resident ambassadors (or some type of buddy system) to help guide you through your first days. They’ll pair you with a person or persons who share similar interests or backgrounds to show you the ropes and help you feel welcome. Even if you’re still uncertain about leaving home, make the effort to be open and welcoming as well and you may be surprised at how quickly you become one of the gang. Keep in mind, these residents have been where you are and may also have some tips that helped them when they first moved. Another quick way to find friends (and your niche) is to immediately start participating in activities. In a senior living community like Sonata, there is always something going on; often a full calendar of options. From educational and enrichment programs to social activities and outings to enjoy, there’s no doubt you’ll find a range of ways to pursue your interests. Your resident ambassador or the community’s Lifestyle Director can provide you with the monthly calendar. Another tough one is that first meal in your new community. Even if you’ve visited prior, that first meal as a resident can be stressful. But, it doesn’t have to be. Have a family member join you, sit with your resident ambassador or both to take the edge off as you meet and talk with new friends and neighbors, and best of all, in a Sonata senior living community you can indulge in the delicious chef-prepared food! Above all on your first day and all those that follow, try your best to relax because you’ve got a lot to look forward to. Scheduling a visit is the best way to get a feel for our senior living community. During your visit, you'll be able to experience different living options, check out our numerous amenities, and speak to residents.